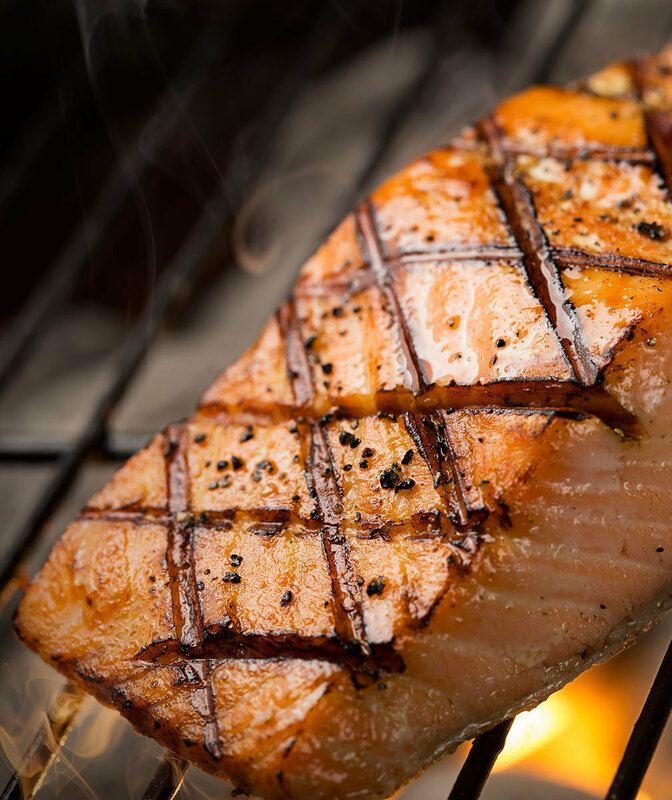 Angie Mar explains simple ways to make brighter, more flavorful meat dishes on the grill this summer. Last summer, you might have been content to keep things simple: A few steaks on the grill (with this ancho rub perhaps?) or juicy, tender, but unfussy burgers. There’s certainly nothing wrong with that approach—grilling classics never go out of style, and the beauty of grilling season is that you can make a great meal with little to no frills. With all the knowledge and experience you gained working the grill in summers past, though, you’re probably ready to up your grilling game, and try out more advanced techniques. Enter Angie Mar—the patron saint of all things meat—who has a few tips for taking things to the next level this summer. Here are three easy ways to elevate all the grilled dishes you’ll be cooking up this summer, plus plenty of our best recipes to get you started. Fresh herbs can liven up pretty much any cut of meat. Mar pairs rosemary, lavender, thyme, and mint with steak, and uses rosemary and thyme with lamb and grilled chicken. She'll cook rosemary directly on the grill because it becomes "beautiful and fragrant" over very low heat. For less sturdy herbs, like lavender and thyme, she tosses them in the pan to infuse butter or beef fat when she's basting. Looking to go the seafood route this summer? You can also give grilled snapper an herbaceous boost by stuffing it with parsley, tarragon, and lemon zest, while mint and basil make a flavorful, leafy green bed for scallops prepared on the grill. In fact, you might want to focus more on mint in particular. It’s much more versatile than you might think. “One of my favorite things about summer is that there is a beautiful array of mints: spearmint, chocolate mint, and pineapple mint,” says Mar. This herb—which you already know goes well with lamb—can accompany several unexpected grilled dishes: Mint adds “complex” flavors reminiscent of North African cuisine to sardines with almonds and works great on pork tenderloin too. Mar says you can’t go wrong with grilling red meat alongside fruit, especially cherries and blackberries, which are, in her book, no-fail options. And stone fruit goes especially well with steak. She'll grill halved stone fruit over direct heat, or wrap slices in foil and place the package on the grill in an area with lower heat, "where the sugars can caramelize and the flesh can soften and cook through." She cook cherries and blackberries separately, typically in a small sauté pan, either on the grill or the stove. She then tosses the fruit in the juices that have rendered off the grilled meat. Try pairing grilled skirt steak with a fruit salsa of tomatoes and pitted, sweet cherries or jalapenos and halved peaches (which go right on the grill with the steak), or serve it alongside a jicama and sweet plum salad. And you should probably add grilled fruit to sangria, too. Another easy way Mar likes to amp up the flavor is by cooking directly on coals. "It gives the meat a deeply charred effect, completely different from that of a grill grate," she explains. "Or, sometimes, I like to roast it slowly, and off center, so the meat achieves a deeply smoky flavor, then finishing it on the higher heat areas to develop color." For this tip, check out our guide to grilling directly on hot coals.